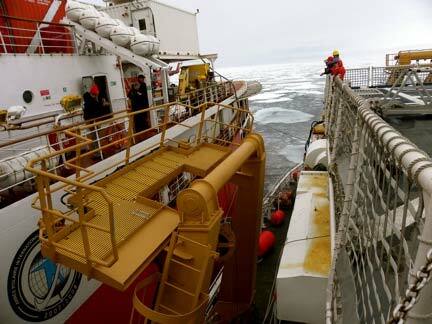 The two icebreakers are tying up side-by-side so that we can visit each other. Today we “rafted” with the Louis (the ships tied together side by side). 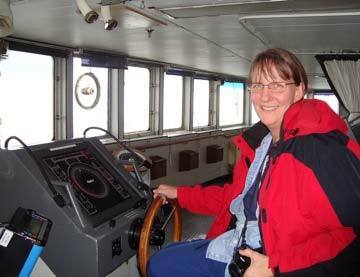 I have been eager to see the science instruments that the Canadian ship is carrying. Once the ships were securely tied together we could just walk back and forth between them and tour the Canadian vessel. 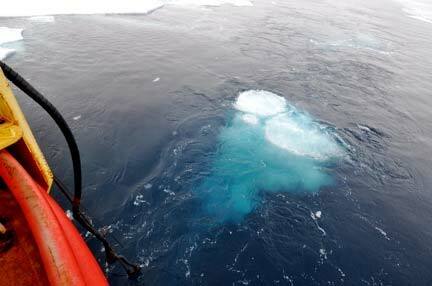 The Healy has been breaking ice so that the Louis can have an easier time collecting data using seismic reflection profiling. The goal is for the Canadian scientists to determine how deep the sediments are in this part of the Arctic Basin. The sound waves their instrument sends out can penetrate about 1500 meters below the seafloor. Using sound they can “see” inside the earth – amazing! FOR MY STUDENTS: Remember your Latin/Greek word parts? Look up “seism”. Here is how it works. The Louis steams forward at a low speed following in the path that the Healy has created through the ice. The Louis tows behind a weighted sled with 3 airguns suspended from the bottom. This sinks about 10 meters below the water. 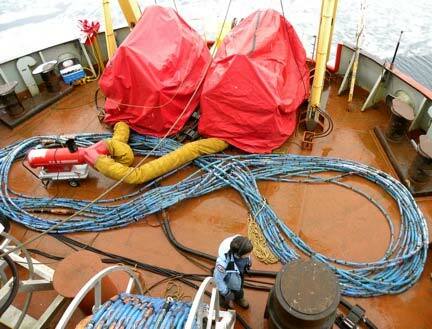 Attached to the sled is a long tube filled with hydrophones (underwater microphones) called a streamer. This streamer is about 400 meters long and stretches out behind the ship. It is best for the ship to move continuously so that the streamer will not sink or float to the surface. FOR MY STUDENTS: Try to picture a 400-meter long “tail” on a ship. That is longer than 4 football fields. The airguns create a huge air bubble in the water. When it collapses, it creates a sound pulse. Two of the guns use a low frequency, which will penetrate deep into the sea floor but will create a low-resolution image. The other gun uses a high frequency, which does not penetrate as deep but gives a high-resolution image. The 16 sound recorders in the streamer record the echo created by these sounds reflecting from the sediment layers below the sea floor. The final product this instrument creates is an image of a cross section through the Earth. Scientists can look at these by observing this geologic history, the scientists are looking back in time. You can imagine that ice can cause lots of problems when a ship is towing a 400-meter long streamer behind it. This is why we are working on collecting this data together. One ship breaks, the other collects the seismic reflection data. Steamer on deck of Louis. The blue steamer is out of the water and lying on deck when we visit the Louis. The crew has been looking forward to the two ships tying up together for the entire cruise. Everyone is curious about the other ship. What are the staterooms like? What is the food like? How is their bridge different from our bridge? And of course there is shopping!! Both of the ship stores had their best Louis and Healy gear ready for the eager shoppers. After learning about the science instruments aboard the Louis, it was nice to finally see the seismic sled, streamers, and the computer nerve center where the seismic images are received. The ships are pretty different in their appearance. The Louis is an older vessel and has wooden handrails, panels cover the wires in the ceiling, and there are some larger windows with actual curtains. The Healy was built to be a science research icebreaker and so has many large spaces for science and looks generally more industrial. The Louis was an icebreaker first and some of their science spaces have been added later and are less spacious. Shopping and tours were fun but the most anticipated events of the day were the evening meal, contests and games. The ship’s officers exchanged gifts in a formal presentation and then we had an amazing buffet together. 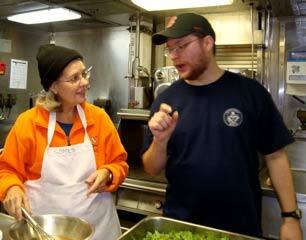 Personnel from both ships enjoyed scallops, halibut, salmon, shrimp, lobster, pork, beef, cheese, salads, and desserts. This was an exceptional meal and a great social event. The idea of having Teachers at Sea (TAS) was a new one for most Canadians I spoke with and as we talked they seemed to think this TAS would be a great idea to stimulate interest in young Canadians about maritime careers. The evening concluded with some friendly competitions between the crews and the science parties. This entire event was a lot of work for the Coast Guard crews. The science party really appreciates all the hours they put into planning this event! Behind the wheel on the bridge of the Louis S. St. Laurent. The official name of our ship is the United States Coast Guard Cutter Healy (USCGC Healy for short). There are 3 icebreakers in the Coast Guard fleet, Polar Star, Polar Sea, and the Healy. The homeport of all 3 icebreakers is Seattle, Washington. Healy is the newest icebreaker and because of her advanced technology, she can operate with half the crew of the Polar-class ships. The Healy was specifically built to do science research in the Arctic. FOR MY STUDENTS: Can you convert knots to miles/hour? How fast can the Healy go? 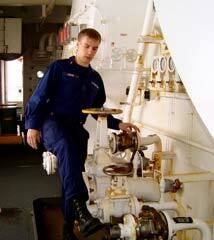 Ensign Nick Custer shows us where the ship is refueled. Can you imagine pumping a million gallons of fuel!!! 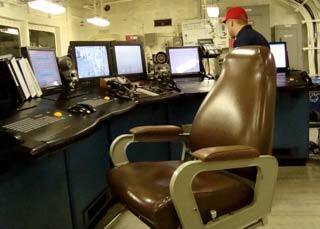 On my tour of the ship I was struck by how much attention has been put onto safety and backup systems. For example, we are currently running on 2 engines. When ice is heavy we might need 3. 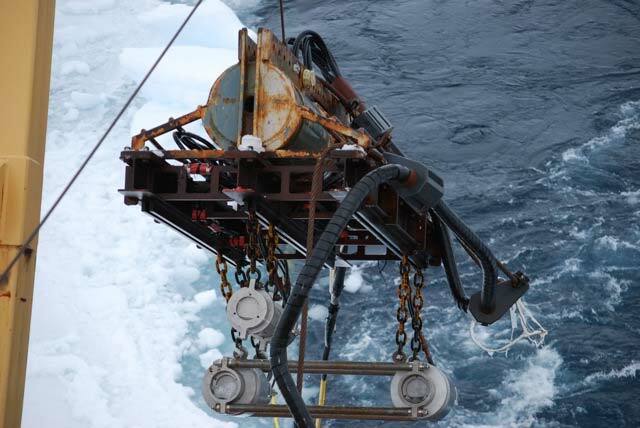 But the Healy has 4 engines so that if one breaks down – the ship can still navigate safely through ice-covered waters. Another safety feature is that all the engineering functions are compartmentalized and separated with watertight and fireproof doors. If something goes wrong in one area (flood, fire) – that area can be closed off and the rest of the ship can carry on. 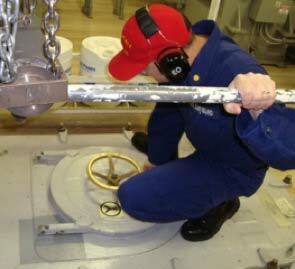 Over the decades, ship builders have learned to design ships with such features to make life at sea safer for sailors. buttermilk cornbread and apple crisp. Christina Franco de Lacerda from Brazil came up with the Lentil soup and the apple crisp was my idea. There is nothing like working in the kitchen together to build camaraderie! The meal was delicious, the music was great, and a good time was had by all! Today we sailed further north than I have ever been. As I watch our track on the map and watch the latitude climb, I get more and more excited. In the next few days we hope to travel even further north and hopefully see some multiyear ice and clearer skies. With less melted ice, there is less moisture in the atmosphere and therefore less chance of fog. My students sent lots of questions last week and I really enjoyed answering them. Keep the questions coming!!! Master chef, Jennifer Henderson, keeps her eye on the Barbara Moore and Will Fessenden design the grits perfect Caesar salad dressing.